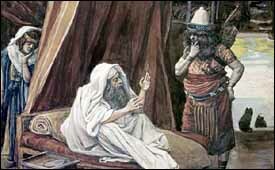 James J. Tissot, "Isaac Sends Esau to Hunt"(c. 1896-1902), gouache on board, Jewish Museum, New York. Jacob is the grandson of Abraham, to whom God revealed himself, and the son of Isaac. He is born a twin and spends his life in sibling rivalry with his (slightly) older brother Esau. He has two streaks that are to dominate his life: a sly, deceptive nature and a quest for spiritual things. As his spiritual side grows, his deceptive side diminishes. Because his deceptive behavior incurs Esau's anger, Jacob flees for his life to Haran, the family's ancestral home in Mesopotamia. There he acquires two wives, two concubines, and a dozen children. When he arrives in Haran, he has only the clothes on his back to call his own. He leaves 20 years later a wealthy man, which he attributes to God's blessing. As he returns to Canaan, he wrestles with God, reconciles with Esau, and settles again in the Promised Land, living at Succoth, Shechem, Bethel, Hebron, and finally Goshen in Egypt. His sons are jealous of Jacob's favorite son Joseph, whom they sell into slavery. But Joseph eventually rises to second in command of all Egypt. When Jacob is an old man, a famine devastates Canaan, forcing the family to buy grain in Egypt. Through a course of events, Joseph reconciles with his brothers and moves the entire clan to Egypt, where Jacob dies at age 147. There it is in a nutshell, but we'll spend seven weeks examining the lessons and significance of his life. Jacob grows up with the monotheistic faith of his father and grandfather, but the family in Mesopotamia are idolaters and polytheists, worshippers of many gods (Joshua 24:2). Stele of Ur-Nammu (ca. 2200 BC), detail showing the crescent moon, the moon god's symbol. Jacob's wife Rachel, who grows up in Mesopotamia, steals her father's "household gods" (31:32-35; 35:2-4). Her family's names -- Terah, Laban, Sarah, and Milcah -- contain linguistic elements that reveal allegiance to the moon-god,1 who is referred to in several inscriptions as "Sin/Shahar, the Lord of Haran. "2 He was the tutelary god of Haran. Worship of the moon god involved temples as well as ziggurats with small temples on the top. These temples were staffed by priests (who offered sacrifices and made libations), singers and musicians, as well as male and female prostitutes (whose activities many scholars relate to the fertility cult).3 Much later than Jacob, the Israelites are warned against worship of the moon, sun, and stars (Deuteronomy 4:19; 17:2-5), though this kind of worship continued under idolatrous kings (2 Kings 23:5-12). Jacob, however, is a monotheist, a worshipper of one God. He uses primarily three words for God. El Shaddai ("Almighty God") is used occasionally by Isaac and Jacob (28:3; 35:11; 43:14; 48:3; 49:25). Their relationship with God is personal rather than formal. However, Jacob and the other patriarchs practiced various forms of worship, including building altars, erecting stones,� offering sacrifices and libations, calling on the name of Yahweh, circumcision, prayer, making vows, and tithing. We'll examine some of these further as we study the details of Jacob's life. Our focus will not be on speculative theories of sources, but on the Book of Genesis that comes down to us in the Bible and the meaning of that revelation. When did Jacob live? Dating is complex. It is difficult to find fixed events in Genesis that can be connected absolutely to dates established from archaeology. As a semi-nomadic shepherd, Jacob moved frequently, especially in his earlier years. Here are some of the places he lived. We've placed Jacob and his family in history and in geography. Now it's time to examine their story to see what we can learn about their God -- and ours. 1. Kidner, Genesis, p. 111. 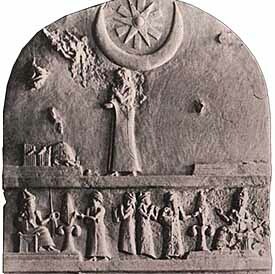 Sarai (Sarah) is the equivalent of sarratu, "queen," an Akkadian translation of a Sumerian name for Ningal, the female partner of the moon-god Sin. Milcah is the same as the name of the goddess Malkatu, the daughter of Sin. Laban means "white," or "white one," a poetic name for the full moon (Hamilton, Genesis 1-17, p. 363). 2. Alfred J. Hoerth, Gerald L. Mattingly, and Edwin M. Yamauchi, Peoples of the Old Testament World (Baker Book House/Lutterworth Press, 1994), p. 226. 3. Robert H. Stein, "Sumer," ISBE 4:653-662. 4. It may appear in Exodus 3:8 that God had never before been called Yahweh, but that clearly isn't the case. The revelation of I AM to Moses was new, but Yahweh had been worshipped by Abraham and his descendents and had found its way into the names of their children for generations. "In Exodus 6:3 the Lord explains to Moses that by his name Yahweh he had not been "known" to the patriarchs, meaning "know" (see yada') in its fullest sense: the name was in use (12:8; 15:2, 7, 8) but was not appreciated in the redemptive significance that it acquired under Moses. (J. A. Motyer, The Revelation of the Divine Name, cited in TWOT #484). 5. Roland K. Harrison, "Abraham," ISBE 1:17. 6. R.N. Whybray, Introduction to the Pentateuch (Eerdmans, 1995), pp. 12-13, cited in T. Desmond Alexander, "Authorship of the Pentateuch," DOTP 61-72. 7. Alexander, DOTP 61-72; Hamilton, Genesis 1-17, pp. 11-38. 8. Eugene H. Merrill, "Chronology," DOTP 121, Table 3. There are problems, however. First, textual: the Greek Septuagint and the Samaritan Pentateuch agree with Paul (Galatians 3:17) that the 430 years of Exodus 12:40 apply to the whole time span between Abraham and the Exodus, not just the Israelite stay in Egypt as the Hebrew Masoretic text would suggest, bringing Abraham's birth year to 1952 BC (John N. Oswalt, "Chronology of the OT," ISBE 1:673-685). Second, genealogies in the Bible occasionally skip generations. 9. One prong is the dating of the destruction of Sodom and Gomorrah (Genesis 19) by some kind of cataclysmic event, which archaeological evidence seems to point to around 1900 BC (Roland K. Harrison, "Cities of the Valley," ISBE 1:704; Roland K. Harrison, "Abraham," ISBE 1:17). You can also compare the lifestyle described in Genesis to archaeological findings to find a match. At the end of the Early Bronze Age (2400 to 2000 BC), Palestine was in a pre-urban phase, with numerous settlements, camps, and cemeteries in the Jordan Valley and the Negev-Sinai. The Palestine described in Genesis also was sparsely populated, with few if any urban centers. By about 1800 BC, a number of urban centers had developed -- Dan, Hazor, Akko, Shechem, Aphek, Jerusalem, Jericho, and Ashdod. By 1600 BC, there were a number of heavily fortified sites, such as Gezer and Shechem. But, by 1550 BC, nearly every city in Palestine had been destroyed by the Egyptians driving out the Hyksos from Egypt (Mark W. Chavalas, "Archaeology," DOTP 37-49. John Arthur Thompson, "Shechem," DBA, 410-411). The Hyksos, a Semitic rather than Egyptian people, ruled over Syria, Palestine, and Egypt from 1650 to 1542 BC until they were driven out by the Egyptian Amosis (Pharaoh Amenhotep I), founder of the Eighteenth Dynasty. It is easier to image the non-Egyptian slave Joseph rising to the position of second in the kingdom under a Hyksos ruler (1786 to 1575 BC), than under an Egyptian ruler, either before or after the Hyksos period. The period after the Hyksos dynasties would be expected to yield the pharaoh "who knew not Joseph" (Exodus 1:8), who would oppress the Semitic peoples remaining in Egypt (Hamilton, Genesis 1:59-67.) Depending upon how one views the evidence, Abraham might fit into Middle Bronze I (2100-1900 BC, Nelson Glueck and William F. Albright), Middle Bronze II (1900-1550, Ephraim A. Speiser), or the Amarna Period of the Late Bronze Age (early 14th century, Cyrus H. Gordon). Barry J. Beitzel (The Moody Atlas of Bible Lands (Moody Press, 1985), pp. 82-86) sees the patriarchal sojourn in Canaan from 1875 to 1660 BC, with Joseph promoted about 1670 BC, in the middle of the Hyksos occupation of Egypt. 10. An early date for the Exodus is based primarily on 1 Kings 6:1. For a detailed discussion of Old Testament chronology and how aracheological finds bear on the issue see John N. Oswalt, "Chronology of the OT," ISBE 1:673-685; John H. Walton, "Exodus, Date of," DOTP, pp. 258-272. 11. A late date for the Exodus is based primarily on the reconstructions of archeologists. 12. Based primarily on Eugene H. Merrill, "Chronology," DOTP, p. 121, Table 3: Patriarchal Chronological Data. 13. According to Arab tradition, it may possibly be identified with modern 'Ain Muweileh, about 7 miles west of Kadesh-barnea and about 47 miles southwest of Beer-sheba (D.D. Gerard, "Beer-Lahai-Roi," ISBE 1:448). 14. Tell es-Seba', the site of the ancient town, is located at the juncture of the Wadi Seba' and the Wadi Khelil (Anson F. Rainey, "Beer-sheba," ISBE 1:448-451). 15. Gerar has been tentatively identified with Tell Abu Hureirah (Anson F. Rainey, "Gerar," ISBE 2:446-447). 16. Haran lies along the Jullab River, near the source of the Balikh River, 24 miles southeast of the Turkish city Urfa, and 60 miles north of the confluence of the Euphrates and Balikh Rivers. It is located on the main road that ran from Nineveh to Carchemish and was regarded as of considerable importance by the Assyrian kings. Its chief cult was that of the Mesopotamian moon-god Sin. It was probably founded as a merchant outpost by the Sumerian city of Ur in the late third millennium BC. The name Haran means "highway, road, or caravan" in Akkadian. Today a village on this site consists of beehive shaped houses. Archaeological evidence includes inscriptional evidence for the Sin temple (from the beginning of the second millennium), a stella of the moon-god, and violent destruction about 610 BC by the Scythians, Medes, and Chaldeans (Mark W. Chavalas, "Haran," DOTP 379-381; Robert J. Hughes, III, "Haran," ISBE 2:614). 17. It is located in the territory assigned to the tribe of Gad (Joshua 13:27) near the Jordan Valley, usually identified with Tell Deir 'Alla, two miles north of the Jabbok River (R.D. Patterson, "sākak, TWOT #1492e). 18. Shechem was a city-state founded about 1900 BC, in the Amorite period of the Middle Bronze IIA era. It is referred to in Egyptian inscriptions both of conquered cities and among Asiatic enemies of Egypt (G. Ernest Wright and E.F. Campbell, "Shechem," ISBE 4:458-462). 19. Luz was founded about 2000 BC. In the early Hyksos period (about 1750 BC) the city wall on the north side was reinforced with a wide clay revetment (William Ewing and Roland K. Harrison, "Bethel," ISBE 1:465-467). 20. Numbers 32:22 indicates that Hebron was built seven years before the Egyptian city of Zoan (Tanis), probably a Hyksos building project, dating it at approximately 1700 BC, though it had probably been inhabited since the Early Bronze period onward. The traditional site of the cave of Machpelah is now marked by a mosque, formerly a Crusader church. Little archaeological excavation has been done there. ("Negev," Archealogical Encyclopedia of the Holy Land, pp. 171-172; John J. Davis, "Hebron," DAT 232-233. 21. Its exact location is uncertain, depending upon the location of the Hyksos dynasty capital of Avaris or Tanis. Goshen was probably located near Pi-Ramesses. The name "Goshen" is found in the name Phacusa (modern Faqus). According to the narrative of Abbess Astheria, Gaqus is only four miles from Pi-Ramesses (thus locating it), which places Goshen close to the Egyptian seat of government. (Harold G. Stigers, "gōshen, TWOT #390).